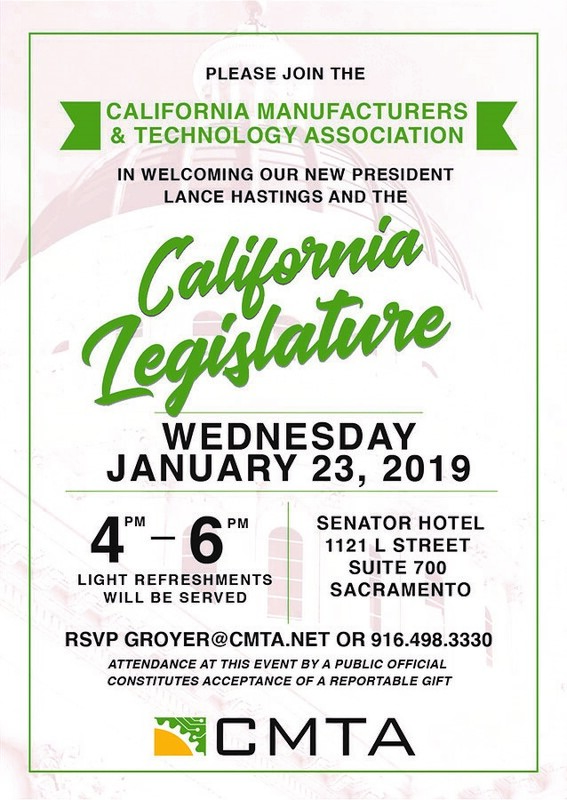 The manufacturers will welcome back the California Legislature to the 2019 Session this Wednesday, January 23rd at an Open House reception at CMTA’s offices. We will also officially welcome our new President Lance Hastings who has a tremendous passion for manufacturing and wants to turn the "California Dream" into the "California Promise" of manufacturing. Last year’s Open House had more than 150 attendees, including more than 30 legislators and several appointed officials from the Administration. It's always fun, so come by and help us kick off the year for #MakingCA! Join us for cocktails and light hors d’oeuvres at our office on 1121 L St., #700 in Sacramento on Wednesday, January 23rd from 4 p.m. to 6 p.m.
RSVP to Geri Royer at groyer@cmta.net or 916-498-3330.